After hosting their wildly popular debut back in January, the Bandwagon Riverboat is back for the second time running, and this time – it will be held over a span of two days! 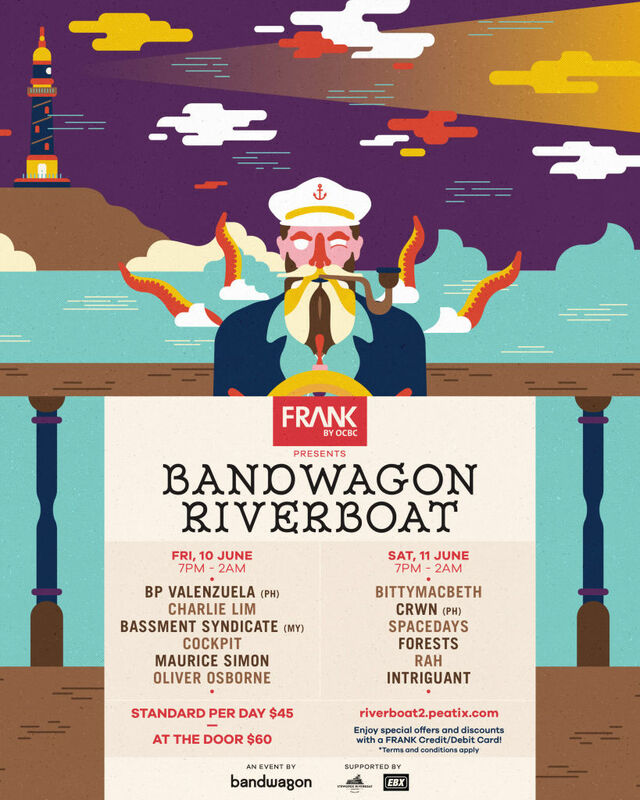 The music festival’s highly-rated line-up will see the likes of acclaimed singer-songwriter Charlie Lim, filipino electronic singer-beatsmith BP Valenzuela, funk bassist-singer Bittymacbeth, cult emo-math rock outfit Forests, and Laneway Festival alumnus Intriguant performing at the Stewords riverboat on 10 and 11 June. The festival’s eclectic line-up mix will see psychedelic groove-rock band Spacedays, chillwave-future bass artist CRWN (PH), satirical metal band Cockpit, Popspoken subculture collaborator Maurice Simon, Darker than Wax’s DJ RAH, Malaysia’s Basement Syndicate and house producer Oliver Osbourne completing the line-up. The previous edition of the Bandwagon Riverboat saw 250 revellers having a rollicking good time on board the Stewords Riverboat, partying to the tunes of Stopgap, Cheating Sons, and Mediocre Haircut Crew. You can read our review here. Tickets can be purchased at $45 for each day at http://riverboat2.peatix.com/.